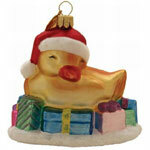 Boston ducklings holiday ornament. Hand-painted glass ornament from Paul March. Size 3" diameter.